Item Builds guide for Arena of Valor's Omen. Each build is geared toward a different play style, so choose one that fits your personal preference. These items are necessary in order to play Omen optimally. Only diverge from a core item if you are a very experienced player and/or you have a very good reason for doing so. Fafnir’s Talon This item is extremely powerful on Omen. It gives him some of the attack speed he needs as well as a powerful passive effect. The HP-based damage Fafnir’s Talon deals counters health stacking enemies. This is important, as health stacking is the go-to defense against true damage like Omen’s. The life steal that the item provides is great as well. Spear of Longinus Despite the added true damage that Thirst provides, armor piercing items are still very useful for Omen. As he is more focused on attack speed than damage, his attacks can be a little weak on their own. Spear of Longinus provides both offensive and defensive stats while also providing cooldown redecution. Omen’s high attack speed allows him to rip off sections of the enemy’s armor with this item, making him a rather fiersome wielder of the spear. Medallion of Troy Offering an immense amount of value both for the amount of gold it costs and for only occupying a single slot, Medallion of Troy is a great pick for anyone looking for durability. Despite its magic defense focus, most teams will have at least one hero that primarily deals magic damage, so Omen will always need some sort of magic defense. Omni Arms Omen benefits greatly from each of the stats that Omni Arms offers. In addition, projectiles reflected by Untouchable will benefit from the damage as well. Frost Cape is another good choice for a similar effect, though the pace of his skills lead to Hyoga’s Edge being a more reliable slow. Mail of Pain Omen can have a hard time approaching marksmen. Mail of Pain gives him some relief by punishing any who try to attack him from afar. This synergizes with Untouchable, allowing him to do moderate damage before he even gets close. Shield of the Lost Shield of the Lost will get a lot of mileage on Omen. The warrior will regularly be in the center of fights, spreading the aura out to multiple heroes. The stats it provides goes a long way toward hardening the Insatiable skin as well. The Aegis is a tempting choice here for that delicious 20% cooldown reduction, however the boost to mana instead of health made it feel rather out of place. Hyoga’s Edge Mobility is Omen’s biggest weakness, his lanky legs unable to keep pace with some of the more agile heroes. As such, he needs either something to speed him up or slow his enemies down. Hyoga’s Edge provides both along with a number of nice defensive stats. Again, Frost Cape is a possible alternative, however Omen generally won’t be spamming his abilities enough to get full use out of the cape. Keep in mind that both passives activate if a hero attacks Omen while Untouchable is active. 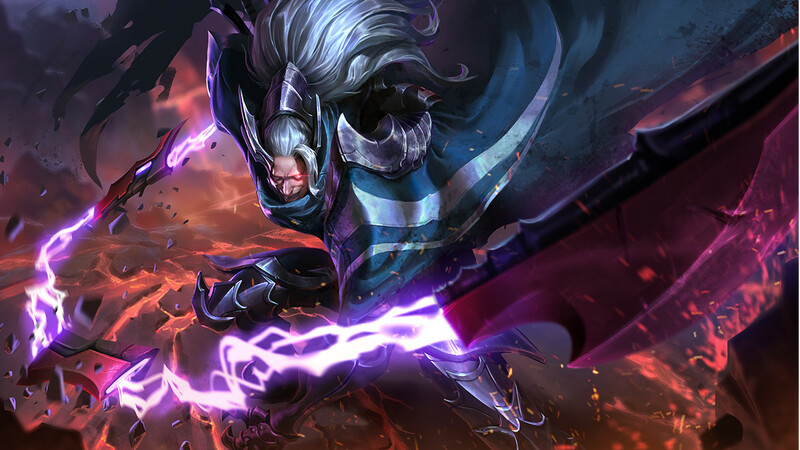 This is going to be Omen’s go-to role, his kit suited well for the Dark Slayer lane. Fafnir’s Talon and Omni Arms make up the bulk of his offensive ability, allowing him to rip through squishier heroes and bang up tougher ones. Hyoga’s Edge will keep him up close to enemies and able to withstand some of their retaliation. Mail of Pain pairs well with Untouchable and makes Omen less of a bullseye to marksmen. Grab their bullets and throw them right back at the punks. This build puts Omen in the jungle. He is well suited to ganking, making him alright at jungling. That said, his ability to clear monsters is a bit unimpressive. We go with Leviathan here for the durability and the nice burn it afflicts to those stuck dueling Omen. The next items lean more aggressive in nature so that Omen can keep the murder momentum going after the laning period ends. This build takes a different approach to Omen, giving up on offense completely. Instead, it buffs up his durability and presence in team fights so that he can act as his team’s tank. Death’s Beckon can pull the enemy’s back line into the fight while Death’s Embrace traps them there. The durability of the items mixed with the damage reduction from Untouchable will make Omen an exceptionally hard hero to kill. I’m a main Omen player,so I tried lots of differents build for him. Afther some experiments, I found a build that’s very powrful in him, expecially in mid and late game. Start with guilded greaves, You know the passive and for the fact that Omen doesn’t possess any real escape ability, those boots Will help him a bit (i recommend flicker as talent ti use with this build). Afther that, pick mantel of ra: it gives some physical defence and the passive “burn” suits perfectly on him, dealing magic aoe damage to near enemyes and permitts him to farm faster. For the third choice, pick fafnir’s talon. You have already said why. Then, the star of the build: mail of pain. In combination with mantle of ra’s passive permitts you to litterally destroy marksmen in a One vs one fight, and adds you tankiness and some Pretty good damage too.Then, pick Gaia’s standard: the passive grants you more soustainability and movement Speed, with magic defense. For the last item, I usually take chain lightnin if my team’s winning. With that, You can deal more damage, move faster, attack faster and deal magic damage, united to mail of pain’s and mantle of ra’s passives. But, if my team’s losing, i usually take Blade of eternity, because of the resurrection passive, the physical defence and the other passive that permitts you to deal 10% extra damage. Note that in early game using this build can be Pretty hard, so be sure to get fed well. A very tanky build that hits on a lot of the points that Omen likes. Grants a decent amount of mobility with the inclusion of Gaia’s Standard and almost every item buffs up his defenses in some way. His offense will have a nice bit of power as well, some attack damage slipped in with Fafnir’s Talon and Mantle of Ra while Mantle of Ra and Mail of Pain both work to chip away additionally at the enemy’s life. Hi, nice build. Can i ask about Arcana for Omen ?